We are delighted to announce that once again we will be sponsoring Five Rise Beer Festival. Last year the festival raised over £2000 for local causes and we are very proud to have been a part of that. 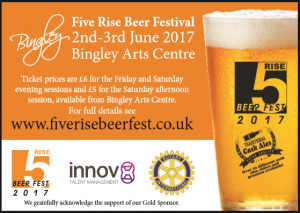 Taking place over the 2nd and 3rd June at the Bingley Arts Centre, the Five Rise Beer Festival is organised by the Rotary Clubs of Bingley, who have raised almost £100,000 over the last 3 years supporting worthy causes locally, nationally and internationally. Taking place at Bingley Arts Centre, around 70 real ales and ciders from all over the UK will be available to try out. For more information on the event please visit Five Rise Beer Fest or follow on Facebook. We hope to see lots of local businesses there to support the community! This entry was posted in News and tagged Bingley, Bingley Arts Centre, Five Rise Beer Fest 2017, Rotary Club of Bingley, Sponsorship on May 10, 2017 by admin.